Registered in The Chinese Armorial, September 18, 2012. Arms: Per fesse Gules and Sable an Eastern Crown Or marked on its circlet with the Chinese Character "Sung" all between four Mullets in cross Argent. Crest: Upon a helm with a wreath Or and Gules mantling Gules and Sable doubled Or, a Swan, wings displayed Argent, on each wing four Mullets in cross Gules, holding in beak by a cord a Kina Shell proper, and gorged with a Coronet Gold. 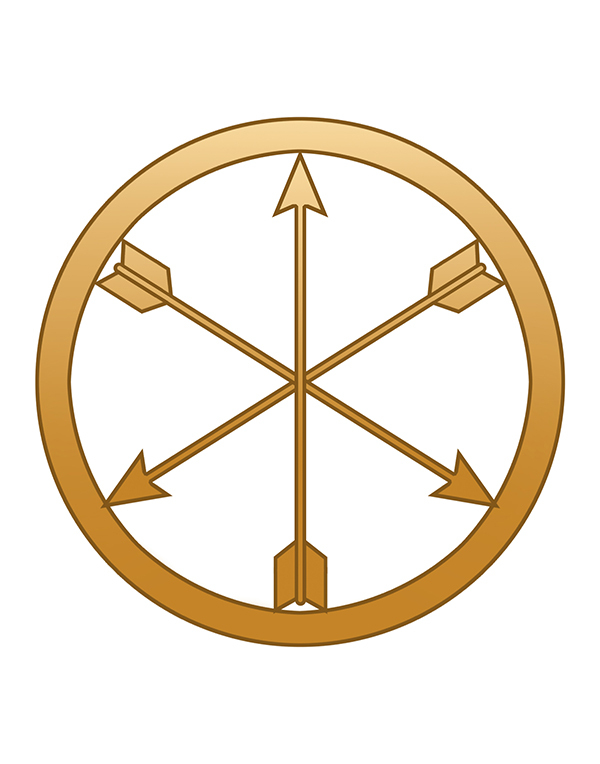 Badge: Within an annulet Or two Arrows in saltire points downward and one Arrow palewise point upwards all Gold. Grant: College of Arms, December 3, 1984. Sir John Yocklunn was born in Canton, China, and immigrated as a child to Australia during the Japanese bombing of Canton. After studying at universities in Australia and Britain, he served as a librarian in the National Library of Australia. He left Australia for Papua New Guinea, where he became National Librarian, principal private secretary to Prime Minister Michael Somare, advisor on honours and awards to the Papua New Guinea Government, assistant director of the royal tour of the Prince of Wales in 1975, and director of the royal tours of the Queen and Prince Philip in 1977 and 1982. He returned to Australia in 1983 to be Chief Librarian of Gippsland Institute of Advanced Education. He was created a Knight Bachelor of the United Kingdom in 1975 for services to government and politics and knighted again, as a Knight Commander of the Royal Victorian Order, in 1977. The surname "Yocklunn" is an error in immigration records. Sir John's family name is actually Soong, and his father was named Soong Yuk-lun, but immigration officials erroneously recorded his surname as "Yocklunn" when he went to Australia in the 1900's. The family has used the name since then. The shield is divided into a red upper half and a black lower half, like the flag of Papua New Guinea. The Eastern Crown is a heraldic symbol of service in the East, and in this coat of arms, also symbolizes Sir John's Chinese origin. The four silver stars are reminiscent of the four large stars on the Southern Cross, which appears on the flags of Australia and Papua New Guinea. The Chinese family name Sung (Soong) is Sir John's family name, making his coats of arms one of the few that shows the name of the armiger. The white swan symbolizes Sir John's relationship to Britain, where he studied at University of Sheffield. He also liaised with the British Government when advising the Papua New Guinea Government on honours and awards. The ducal coronet around the swan's neck symbolizes his organization of three royal visits to Papua New Guinea. The swan holds a kina in its beak. The kina is a pearl shell carved into a crescent with pierced horns. It is worn as a breast ornament and used as a traditional form of currency in Papua New Guinea. It symbolizes Sir John's public and political service in Papua New Guinea. The arrows in the badge are weapons still used in Papua New Guinea. The flights of the three arrows are arranged into the shape of the letter Y to symbolize the Yocklunn family. The annulet around the three arrows makes the badge similar in appearance to a mon (a Japanese family insignia) to show Sir John's appreciation of that Japanese form of heraldry. When Sir John petitioned for his grant of arms, he had requested that his sister be included as one of the heirs to the arms, but the heralds overlooked her when they wrote the Letters Patent. On September 28, 1992, the College of Arms added an endorsement to the back of the Letters Patent to extend the grant to other descendants of Sir John's father, Charles Soong Yocklunn. The endorsement effectively extended the grant to Sir John's sister, Mrs. Moya Germain. 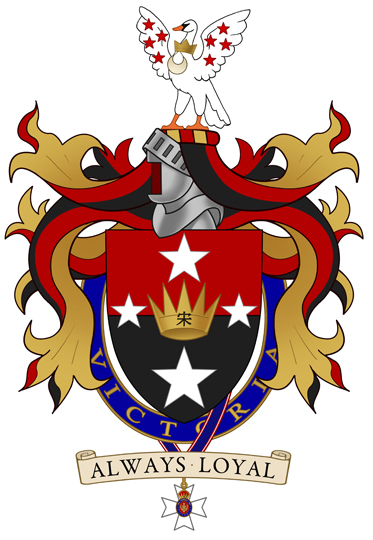 (Information compiled from: "The Yocklunn Arms: An Explanation", The Coat of Arms, vol. 8, no. 149, spring 1990; "East Meets West: The Arms of Sir John Yocklunn" by Stephen Szabo, Heraldry News, no. 46, November 2007; and letter from Sir John Yocklunn to Derwin Mak, September 3, 1990). *Sir John Yocklunn died on April 7, 2016.